Sterling silver flatware has a long American tradition of use in formal table settings. 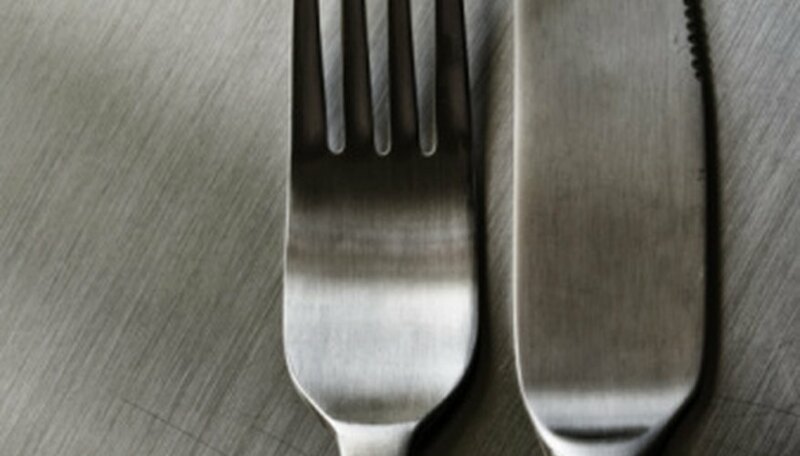 Today, meals are served at home and in restaurants with stainless steel flatware. However, for special occasions like holidays, the china is brought out for use along with formal silver flatware. Silver flatware is often purchased from estate sales or antique stores, with very little known about it. What is the brand? What is the pattern name? Most important, how can you find replacements? Several online sources can give you details about your silver. Examine a piece of the silver flatware about which you want to find more information. Check the design and shape of the front and back. Some silver manufacturers engraved the company name or the pattern name on the back of the flatware. Some makers simply used what was called a mintmark, or perhaps just the initials of the person who made it. Common names for silver flatware are Oneida, Gorham, Towle, International, Cambridge, Dansk, Lunt and Reed & Barton. Make notes of any words written on the silver or any markings, regardless of how insignificant they may seem. A mintmark often looks like just a strange marking on the piece. Start your online search at websites such as Online Encyclopedia of Silver Mark's, Hallmarks or Maker's Marks. This is where you are the most likely to find the name of the maker and the pattern. Some sites contain mintmarks from all over the world with images to go with them. Though the website may not identify the pattern name of the pieces you are researching, you will at least be able to narrow the search by finding the maker. In the event you are unable to find your mintmark with one of the encyclopedia websites, try another resource for locating silver makers by their marks, by using antique websites. Look at additional websites that specialize in silver flatware patterns. Websites such as Replacements.com, Flatwaremall.com and Silvercollect.com are also good places to research your silver pattern. In addition to being able to research your pattern with these vendors, you can also buy replacement pieces. If you have already found the maker of your silver, you need only to click on that maker name. This will bring up pictures of every pattern made by that particular silver manufacturer. With the pictures, you can match a pattern with your pattern. You can also send a photo of the flatware to these site and they will research your pattern in detail. In many cases, there is no cost for this service. Visit an antique dealer who specializes in silver flatware and china. Many dealers have books and catalogs to identify silver patterns. Often, dealers relish the challenge of being able to locate a long-lost silver pattern. Antique dealers may not charge you for looking for a pattern, but it would be courteous to pay them for their time. If the silver piece is worn you may be unable to see a mark because of tarnish. Carefully use a soft cloth and silver polish to remove the tarnish over the mark.